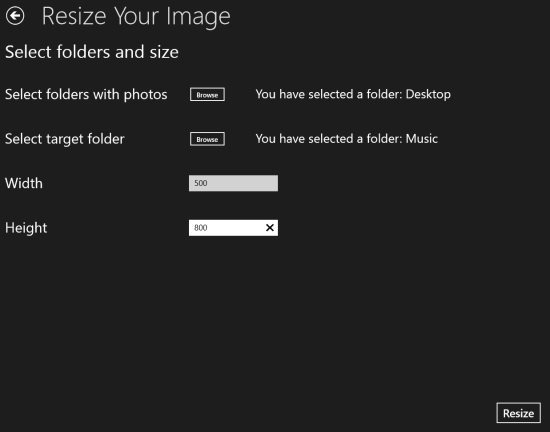 Resize Your Images is a free Windows 8 image resizer app that lets you resize all your photos in just a single click. You can easily resize multiple photos at once. All you need to do is just select a folder holding the photos that are need to be resized ? now, select a folder where you want to locate your resized photos ? now, you need to enter the width and height (in px) to which you want to resize it ? simply, click on ‘Resize’ button and you will instantly find your resized photos stored in the selected folder. 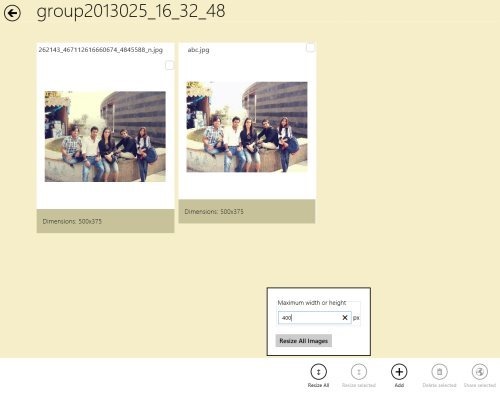 This photo resizing Windows 8 app supports formats such as .jpg, .png, and .bnp. The interface of Resize Your Image app is very simple and does not show any image that you upload. It just enables you to input the size of the image and get the image in your local machine. Go ahead and download Resize You Image app in Windows 8 now. Also, check out our posts on Photo Editing Apps, Apps To Turn Photo Into Painting, and Facebook Client Apps. 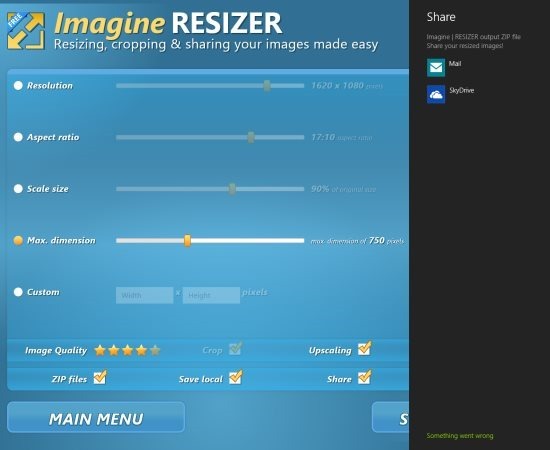 Image RESIZER is another good utility image resizing Windows 8 app that allows you to crop, resize, zip and share photos easily and quickly. All you need to do is select an image from your local picture library ? define you image settings and click on ‘Start Process’. Settings such as Resolution, Aspect Ratio, Scale size, Max. dimension, and Custom. Once you are done with all the settings, you can now send it to others, or to yourself via Email or SkyDrive. Image RESIZER supports input file types such as png, jpg, tiff, gif, & bmp and supports output formats such as jpg and ZIP. It’s a good utility Windows 8 image resizing app. Go ahead and download Image RESIZER app in Windows 8 now. Stiledit Resizer is yet another powerful image resizer app for Windows 8 where you can resize your photo individually or in groups and share those resized images with others using Windows 8’s Share charm. All you need to do is open the app, click on ‘Add’ button to add images ? you can select one or multiple images to resize all at once. You can create as many groups as you want, resize all the images in a group or just select the ones you want to resize ? now, click on ‘Resize All’ or select some to resize ? input the maximum width or height in the resizing box and hit ‘Enter’. However, you need to make sure that if you enlarge an image from its original size, it will lower the image quality. Hence, the app is useful if you want to reduce the size. You can also delete groups, rename groups, etc. Go ahead and download Stiledit Resizer app in Windows 8 now.